New Offer - All registered users of Training Kids for Speed and Maintaining Form will be able to download all future updates for free. I found the Training Kids for Speed manual very interesting. I have recently completed a Level 1 Basic Course to help my son who is quite talented. The manual will be a valuable asset to my growing library. As a coach of sprinters and hurdlers i found your e-books very interesting. I met Paul Doyle from Speed Dynamics (Atlanta) a few years ago and learnt of the new biomechanics of sprinting from him. I think that you could include a chapter on acceleration and bring out the differences with maximum sprinting from a technique point of view. Other than that well done on two excellent books. I found the book to be excellent! Are there any videos available? The information you provided has helepd my son's training in track. He has improved his form and oerformance. Greta job ! Books are very helpful. We have a sophmore 3200 meter runner that is currently running 9:50. The book should help him get faster. We will be putting the techniques into practice. I think the training kids for speed book will provide great ideas for a new recreation track program we are starting. I'm looking forward to using the info. Very good information. It has confirmed my belief that middle distance runner must do more than just put in mileage and running only workouts. I like the suggestions and I am planning to implement new additions to our easy day workouts. Obviously, if all athletes were committed to the the same goal, we could make great progress. thanks for the e-book and I look forward to continued articles via e-mail. I thought the book was very informative I am trying to help my 11 yr old son run faster for both baseball and basketball. This book will help with that. I do wish there was some sport specific pages to help with specific sports. Thanks Very informative book. The information was good and I found out that what we do for our track club is very similar, if not the same as you are teaching. It is reassuring that our coaches are on the right path to training our youth atheletes perform properly. I found the book very helpful. We have 3 kids that run track and we have been training them very hard up to the day before the meet, thinking that it would make them stronger for their events. It was very helpful and made alot of sense that kids' neurological systems need to recover for several days before a meet. We tried it on the youngest daughter by not having her do any speed work for 4 days before the meet, with 2 days of no running and her times improved greatly. It would be helpful if there were more info on nutrition, especially what to eat and not eat race day and a few days before. 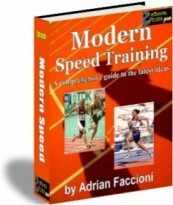 I ordered the Modern Speed Training e-book. This book is everything I hoped it would be in terms of speed development and sprinting. I coach elite sprinters and found the information very practical and useful. I would recommend this book to the coach who really wants to be on the cutting edge of speed development. The information was very useful and I learned many new training methods to improve speed. I particularly felt having other resources available on the net was a welcomed addition. I was not sure if I would like reading a book via computer, but I would certainly purchase another ebook. I found the three ebooks that I purchase for OZTRACK.COM very informative and useful. My son and I find the information very helpful for working with kids and adults who want to improve their running. I have used it to improve my own running techniques and I am looking forward to seeing the next new ebooks, anything on hurlders would be very useful for me. Thanks!!! I thought your book, Training Kids for Speed, was excellent. My only suggestions would be to publish it in hard copy. Also, it would be good to include sample weekly/monthly training schedules--for beginners, intermediate, advanced; or by age group. I am not a "middle distance" runner. I mostly race 5K and up but I feel many of the teachings contained in your book can be applied by those training for events right up through the ultramarathon. 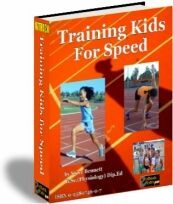 I've already bought "Training Kids for Speed" and "Modern Speed Training" and aside from finding them quite informative, precise and practical, I should say that I really found very convenient the E-Book format. I would really like to find other great books under that format. I've bought paper books from the U.S, and I always have to wait for them for at least a few days, then I have to pay more taxes and in the process, I always hope that the book comes in good condition. Good luck and hope to hear more good news from You All! 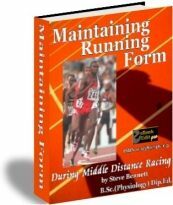 The book (Maintaining Running Form) is incredible and I like that it puts a science to training middle distance. It really puts a method and an explanation to the workouts my coaches are having me do. Finally, I ran into a downloading issue when I inadvertently downloaded the e-book to my network and just wanted to thank you again for working with me on this one. I'm looking forward to making future e-Book purchases. All books - Kids Speed, etc were great. Owner was very,v ery helpful in solving download problems, information in books is excellent and I will definitely order more items! 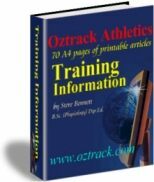 An E-book of all Oztrack Training Information is now available. It contains 70 A4 pages formattted for printing.